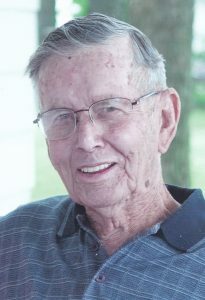 90 year-old Douglas Marion Maloy of Geff, died Monday, February 4 at Fairfield Memorial Hospital in Fairfield. Doug was born December 3, 1928 at Granite City, Illinois to Carl Leroy and Irma Mildred (Moore) Maloy. He married Wilma J. King October 24, 1953 in Fairfield, and she preceded him in death January 7, 2016. Doug was a retired owner of Country Radio and TV in Geff. He was a member of the Cisne American Legion and an Army veteran of the Korean War. Doug is survived by a daughter Dian (Dennis) Downs of Fairfield, and two sons Neal (Marlena) Maloy of Geff, and Bryan (Suzanne) Maloy of Rio, Illinois; five grandchildren Aaron and Anna Maloy of Geff, Katlyn and Joshua Lewis of Flora, Kevin and Emily Maloy of Big Rapids, Michigan, Mark and Alicia Maloy of Austin, Texas and Matthew Maloy of Rio, Illinois and three great grandchildren Tyler, Brienne and Elias. Several nieces and nephews also survive. Preceding him in death was his wife, parents, two brothers and one sister. Funeral services will be 1:00 p.m. Friday, February 8 at Hosselton-Meridith Funeral Home. Burial will be in Cisne Cemetery with full military rites. Visitation will be from 11:00 a.m. to 1:00 p.m. on Friday at the funeral home. Memorials in Doug’s memory may be given to the Activity Department of Aperion Nursing Home and will be accepted at the funeral home. The Hosselton-Meredith Funeral Home in Cisne is in charge of all the arrangements.